Wants to become big NAND player. No plans yet for DRAM. Comes after failed $22B Micron bid. Intel invested $1.5B a year ago for mobile expansion in China (http://newsroom.intel.com/community...nt-and-adoption-of-intel-based-mobile-devices). China's Tsinghua Unigroup Ltd plans to invest 300 billion yuan ($47 billion) over the next five years in a bid to become the world's third-biggest chipmaker, the chairman of the state-backed technology conglomerate said on Monday. A deal could be finalized as early as the end of this month, he said. He declined to give more details but said buying a majority stake was unlikely as it was too "sensitive" for the U.S. government. "If you can't be the top-three giant, it will be very hard to develop your business in the chip industry," Zhao said, citing reports that China imported more chips than crude oil every year. Currently, Qualcomm Inc (QCOM.O) holds the No.3 position in the global chip rankings, behind Samsung Electronics Co Ltd (005930.KS) and market leader Intel Corp (INTC.O), which has a market capitalization of $151.5 billion. There's the Intel Investor Meeting this Thursday (http://www.intc.com/eventdetail.cfm?eventid=166861), but I don't expect anything given the delay. However, Samsung will share their 10nm process in February, more specifically 128Mbit eSRAM: http://www.eetimes.com/document.asp?doc_id=1328272. SAN FRANCISCO. &#8211; Samsung will give a first look at its 10nm process technology at the International Solid-State Circuits Conference here in February. ISSCC also will show significant advances in fingerprint recognition, vision processors and 3-D chip stacks as well as denser memories and a novel Mediatek mobile SoC packing ten cores in three clusters. ISSCC organizers said the device has &#8220;the smallest [SRAM] bitcells to date,&#8221; measuring 0.040&#956;m for a high density (HD) and 0.049&#956;m for a high current (HC) version. The designs sport &#8220;integrated assist circuitry that improves Vmin for the HD and HC bitcells by 130mV and 80mV, respectively,&#8221; according to the ISSCC program released Monday. &#8220;Compared to Samsung&#8217;s 14nm SRAM at 0.064&#956;m2, the 10nm cell is a 0.63X shrink, certainly less than ideal," said David Kanter a microprocessor analyst for The Linley Group and Real World Technologies. &#8220;Compared to Intel's 14nm SRAM cell at 0.049 &#956;m2, Samsung's cell is about a 0.82X shrink, a consequence of the fact that Samsung didn't shrink their metal rules between 20nm and 14nm,&#8221; said Kanter. &#8220;I'd expect Intel's 10nm SRAMs to be much smaller, but they aren't sharing that information yet,&#8221; he added. Intel will also be present, although I don't know why given they won't release another process for like 1.5 years, and given BK's comments of not giving away spoilers so other people can't copy them exactly. A description of the talk admits &#8220;there are growing concerns and doubts over the vitality of Moore&#8217;s Law going forward, given the scaling challenges we face.&#8221; Besides describing Intel&#8217;s current 14nm process, the &#8220;talk will also discuss some leading technology options on the horizon beyond CMOS and their potential design benefits in advancing Moore&#8217;s Law well into the future. Novel 3D heterogeneous integration schemes and new memory technologies will be discussed for their potential in optimizing the memory hierarchy and addressing bandwidth challenges in processor performance and power,&#8221; according to the ISSCC materials. If Intel 10nm is again 0.5x, which Intel said they aim for, then it will be 0.040µm² vs 0.025µm². So, so much for Intel's supposed supposedly losing manufacturing lead. I suppose some people at Intel are having some fun right now. You can't win Moore's Law by renaming your nodes to smaller numbers. Well, everybody seems to be hung up on density. Intel may have done a good job in that aspect on 14nm, but it sure has been troublesome yield wise and I am not sure they got the gain in performance per watt that they were hoping for either. It's a lot of money, but not enough time. The only way this can work, is if they buy a large existing company (global foundries? ), and expand from there. So, so much for Intel's supposed supposedly losing manufacturing lead. Intel has had a de facto lead forever now. The others don't have to match exactly, it's enough to get close enough for a cheap price. Intel isn't selling enough on their own to really grow their business. Their revenue stays mostly flat year over year over year. And any premium they could charge for outside parties evaporates when TSMC/Samsung are close enough at a competitive price. As for the Tsinghua announcement, I find that to be great news. China is an culturally isolationist country, in large part because the domestic market is so enormous. I wouldn't be surprised to find that you could become #3 in the world by focusing just on China. Still, I'd imagine that they would logically expand overseas simply because it makes financial and business sense. That'd be good for consumers, as competition increases and intensifies and more R&D cash is being spent. Lower prices and faster technological progress. 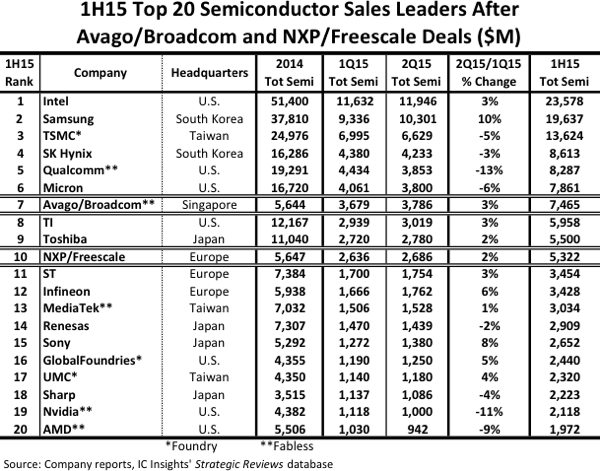 Qualcomm may be tempting if they can get it after the Micron failure. Qualcomm is currently "cheap" and still got a good business. Else SK Hynix perhaps. An outsider would be MediaTek.